The latest numbers for Google+ show that there are approximately 395 million active members, with 34 million unique monthly visits. The Google+ network allows you to create personal profiles, communities, and business pages. In this guide, we’ll cover how businesses can get the most out of their Google+ experience. While not every company should be on Google+, niche interests are still very active on the platform. 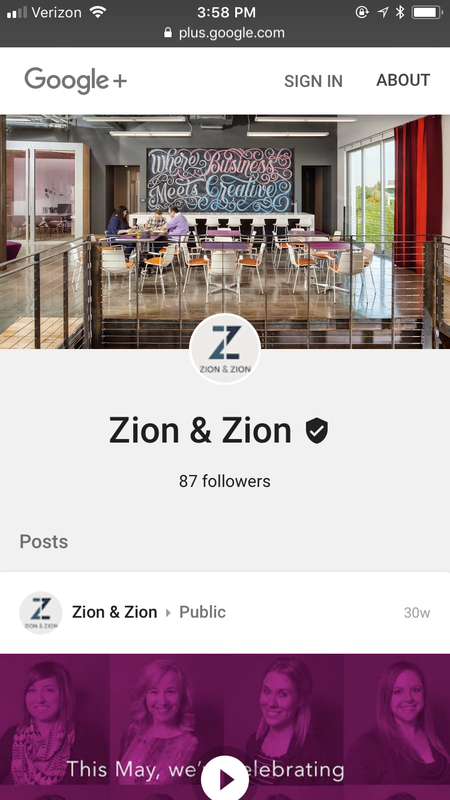 As a leading social media firm, Zion & Zion puts a focus on understanding the ins and outs, as well as the latest updates being made to Google+. Google+ has a list of terms that you need to know for various aspects of your marketing strategy. Here’s a breakdown of the main essentials for your business. Circles are how you organize the pages and profiles you follow on Google+. Business Pages come with four default circles: following, customers, VIPs, and team members. User Profiles come with four default circles: family, friends, acquaintances, and following. You can add more circles to better organize the pages and profiles you follow. You can also use circles to filter your news feed and share updates to only specific people. People who have added your page or profile in their circles. This tab shows your basic profile information. 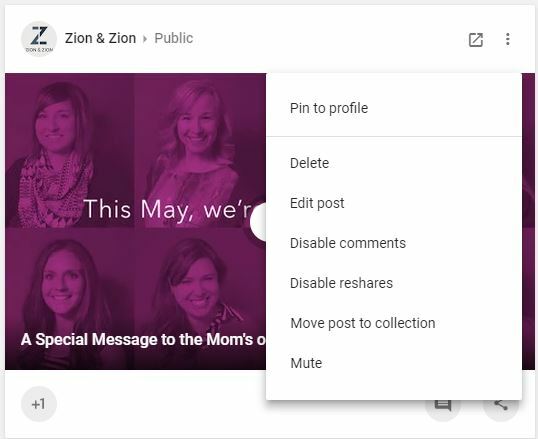 You can share updates to the public, specific circles, or specific people on Google+ with your profile or page. Status update types include text, photo, GIF, link, event, and poll. The equivalent of liking a post on Facebook, for example. On Google+ a like is a +1. You can share other peoples’ posts on your profile or page. You can comment on other peoples’ posts. 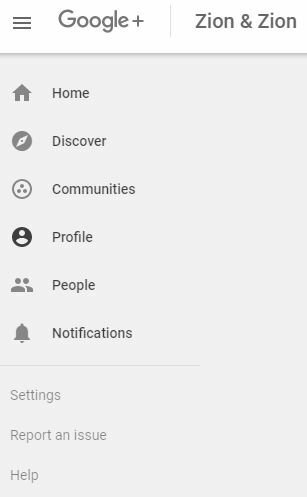 This shows your Google+ news feed with updates from those you have in your profile’s circles. You can use the links above the news feed to filter updates by pages and profiles in specific circles. Like trending topics on Twitter and the explore page on Instagram, this tab will show you posts from people and pages outside of your circles that you may be interested in. Toggle through the top keywords to filter this page further. This will show you the communities you belong to and the ones you’ve been invited to join. You can also click Discover More at the bottom of the page for recommended communities you can join. This shows you your Google+ profile. This tab shows who you’re currently following, your circles, followers, and suggestions of people you can follow. 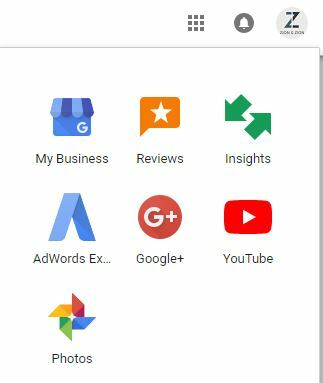 This shows you a summary of your pages’ insights, Google Analytics data for the website linked to your page, Google reviews, and more. This tab shows the latest reviews you’ve given to local businesses. This shows you insights for your local business page including the amount of phone calls and customer actions on the page. This takes you to AdWords Express, a product from Google that automatically manages your online ads. This button takes you to your Google+ profile page. This button takes you to YouTube. This will show you all the photos you’ve uploaded to Google+, including those you’ve shared in status updates. When someone visits your Google+ page on their desktop browser, they’ll see the following. Based on first impressions, here are the most important elements of your Google+ page that appear above the fold. Your cover photo is the most dominant element at the top of your Google+ page. The suggested size is 1080 x 608 pixels. The minimum size for your cover photo is 480 x 270, and the maximum size is 2120 x 1192 pixels. Make sure this is a high-quality photo that represents your business well. Your profile photo, which appears on your page and next to your status updates throughout Google+, is a round photo with a minimum size of 250 x 250 pixels. Be sure to match your profile photo on your Google+ page with those on your other social media profiles so people can easily recognize you. Your number of followers is prominently displayed on your Goggle+ page. Work on increasing this number by following some of our tips later in the guide. Unlike other page types, when you create a local business page on Google My Business, you may have to verify your page. This verification can take up to a couple of weeks because Google may have to mail a postcard to your business address. After, the verification will show on your Google+ page. Beneath your cover photo and tabs, users will see your latest updates next. Just like any other aspect of your online marketing, you should plan your Google+ marketing strategy. To be successful, consider these tactics. Add a Google+ badge to your website. This button will allow your website visitors to follow your Google+ page without having to leave your website. Include a link to your Google+ page in your email signature. Services like WiseStamp allow you to create a professional email signature that includes your social links. Include a link to your Google+ page in your business newsletter. 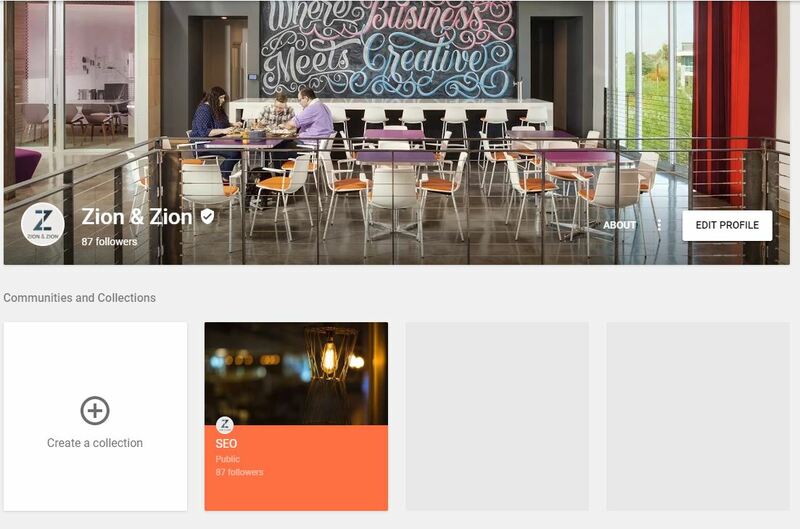 Participate in Google+ communities related to your business. Being an active participant that provides great value almost always results in new followers. 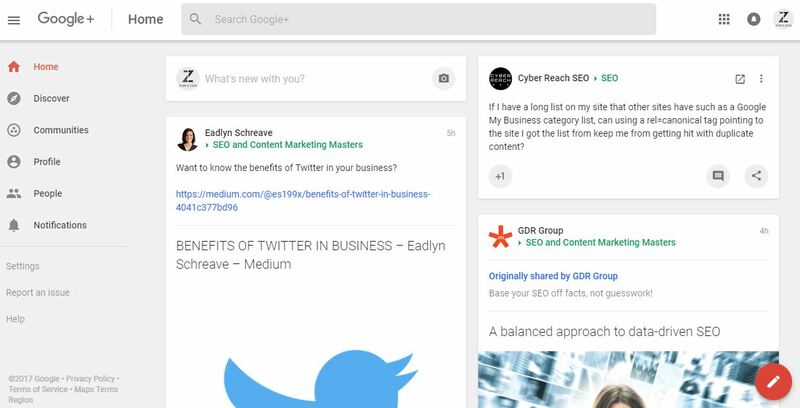 Use Google+ search to find people talking about a topic related to your business. Chime in, without being too salesy. Follow users on Google+ that have the potential to be customers. Whenever they ask questions, answer them. Include a link to your Google+ account on your business card. Encourage employees within your company to have personal Google+ accounts and follow your Google+ page with their personal profiles. Look for other profiles where you have the option to link to your Google+ page. These profiles include Klout, most forum profiles, most author bios for publications, and more. The first, and most basic thing you must do on Google+ is keep your profile active by posting. Google+ updates can include text, photos, links, GIFs, and polls. The text portion of an update is unlimited, although tests have shown updates with more than 100,000 characters can cause errors. Here are some good ideas for what to share in a Google+ update. Polls that invite user participation, preferably related to your industry. Content from top industry publications that aren’t competitors. Links to your blog content, latest videos, press releases, presentations, infographics, etc. Relevant, searchable hashtags to help other Google+ users find your content. You can also pin updates to the top of your profile page, or add them to a collection. We’ll talk about the benefits of collections later in this guide. If you want to offer promotions, offer ones specifically for your Google+ followers. For example, instead of saying that you’re having a 20% off sale today, say that you’re having a 20% off sale exclusively for Google+ followers using discount code GPLUS20. To segment it even further, instead of posting to a Public audience, post your promotion to your followers only, or in a specific collection. This type of promotion will give you the chance to make your Google+ followers feel special and track how many conversions you make from your selected Google+ audience. According to CoSchedule, the following image illustrates the best times to share on Google+. 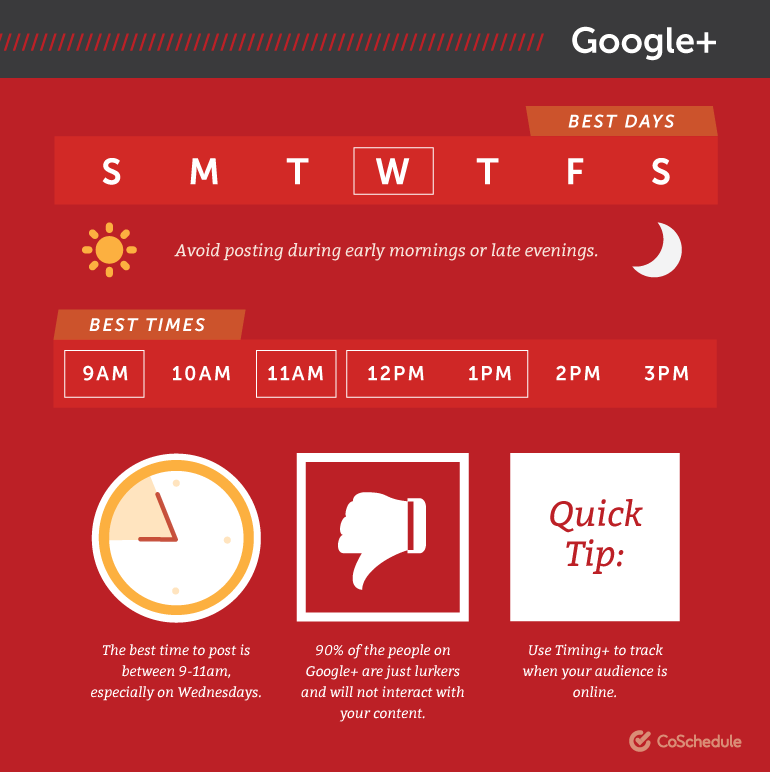 If you’re just starting out, look at popular posting times for popular Google+ users. If you know that their audience is similar to your target audience, then you can use that data for your page. The thing to remember is that not all your followers on Google+ are looking at their news feed at the same time. And perhaps your most influential followers are on at different times from most of your followers. Therefore, you should post throughout the day to reach the largest audience possible. When using Google+ as your page, your notifications tab will give you access to the latest mentions for your business. Use this along with Google+ search to find updates about your business. Be sure to respond to as many mentions of your business as you can by thanking them for loving your brand or offering assistance when someone has a problem with your products or services. 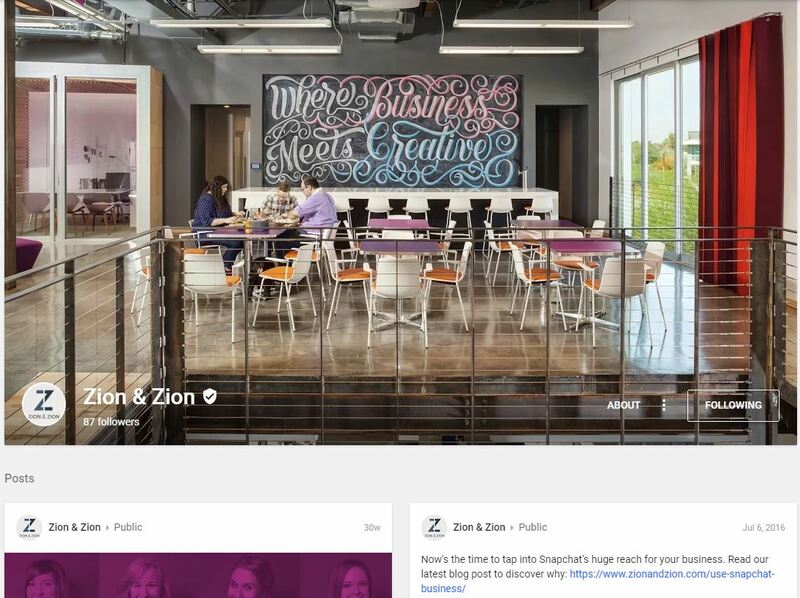 Another feature with Google+ that business pages can take advantage of is Google+ communities. Communities are like Facebook and LinkedIn groups with the exception that business pages can create and participate in Google+ communities, whereas you can only use personal profiles with Facebook and LinkedIn groups. There are a couple of advantages to utilizing Google+ communities as your page. For starters, if you create a community that’s attractive to your target customer base, you can get them to join and start engaging with you. As a creator of a community, you’ll be able to fill out the about information for your community, include links back to your website, and moderate it. Start by looking for communities that fit your industry and participate in them. Note community guidelines, as some communities will allow you to share your own content, while others will not. If you don’t find any good communities for your industry, you’re in a good position to create one. Click ‘New Community’ on the top right of the Communities page to get started. Seek out active communities to join, or make sure to keep the community you create gets updated regularly. For example, photographers should join the Landscape Photography community, which is one of the most active and engaging communities on Google+. 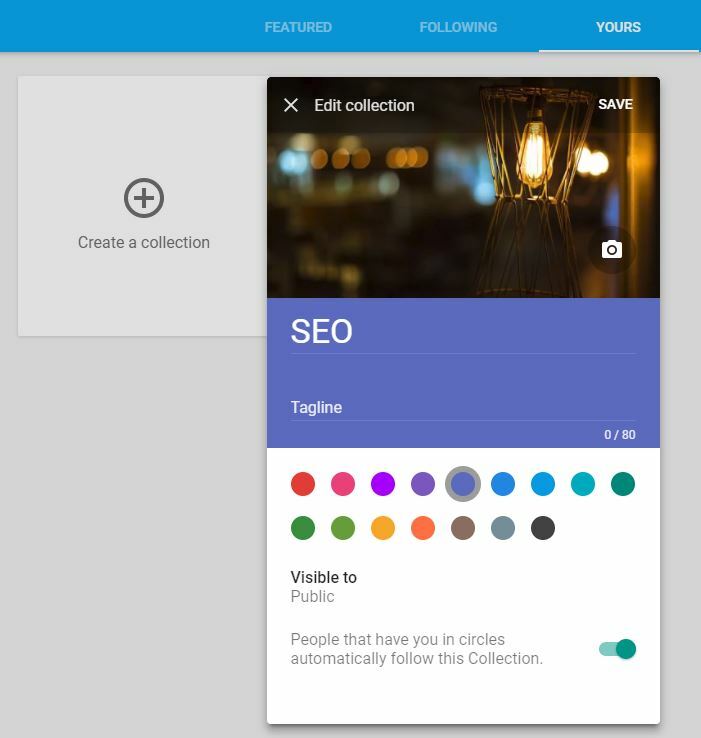 Google+ Collections is a feature that can be handy when you want to segment your posts by topic. If you want to group all SEO posts together, for example, create an SEO collection. Google+ users can follow individual collections they’re interested in. 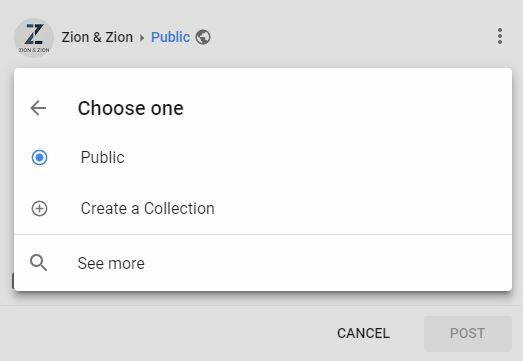 Also, when you create new collections, you can have your followers automatically follow your new collection, or unselect this feature to have users follow your collection on their own. 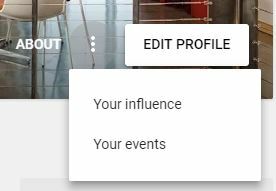 On your Google+ page profile, select the overflow button next to the About button to see your page influence and page events. 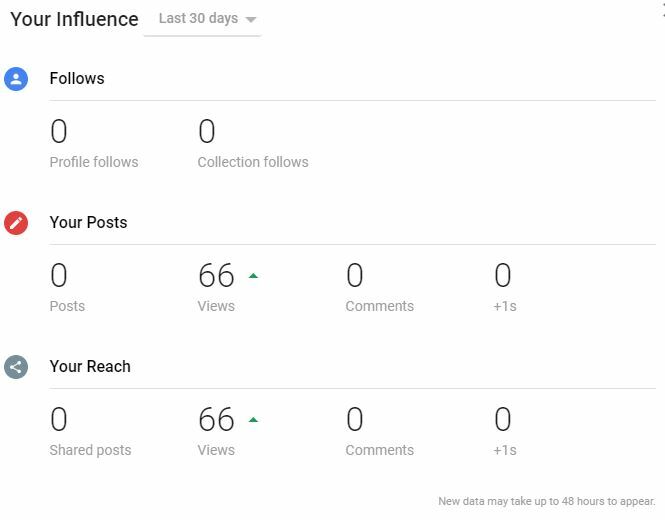 Your page influence shows insights for the past seven or 30 days. You can see how many people followed your profile, how many people followed your collections, how many times your posts have been seen or shared, and how many comments you have on your posts. According to the Google+ Help, these numbers may not be exact, so it’s best to use these numbers in conjunction with a 3rd party reporting platform. We’ll talk about our recommendations toward the end of the guide. With Google+, you’re able to create an event or plan a hangout. From there, you can customize your guest list by inviting the public or just certain circles and individuals. For more help on managing your Google+ events, click check out Google’s support page on managing events. Looking for some helpful tools to assist you in your Google+ marketing strategy? Here are some popular ones to choose from. 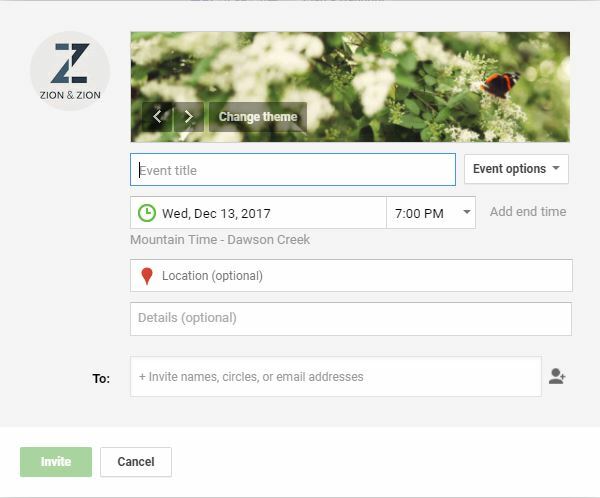 Buffer allows you to create a schedule of when you want to send updates to your Google+ page (along with your other social media accounts). You can add updates to your Buffer, and Buffer will send them out at the next available times on the schedule you created. 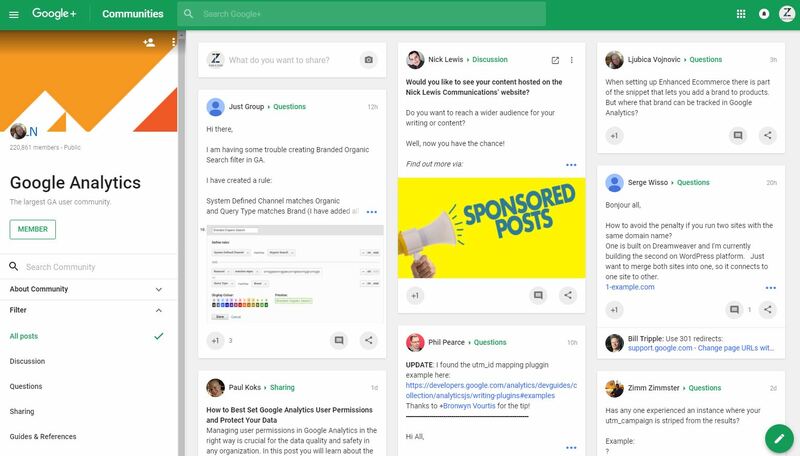 HootSuite is a publishing tool that allows you to send and schedule updates to your Google+ pages, monitor keyword searches, view sent updates, and view updates from your circles, all in a side-by-side column view. Rival IQ is a competitor research tool that allows you to monitor your Google+ presence along with your competitors to ensure that you’re getting the most out of your Google+ marketing in terms of positioning and engagement. SOCi is a social media management platform that’s helpful for managing multiple businesses or business clients. You can schedule content to Google+, among other social media pages. SproutSocial is a social media management tool that helps you manage Twitter, Facebook, LinkedIn, and Google+ for your business.